During the summer of 1981 (when I was twelve years old) I took a Wilton cake decorating course at a local ZCMI department store. I think it was about a six week course? I'm pretty sure I only attended 4 weeks because during that time, my Grandmother died and we went to Idaho for her funeral. I remember feeling like I had gotten a good amount of information and instruction from the time I spent in class so it didn't concern me that I missed the last lesson or two. I made a few different cakes and I think they all turned out pretty great! This clown cake came from an idea book that my Mom bought me when I took the class. I think it was a Wilton Cake Decorating Yearbook magazine and I kept buying those throughout my teenage years and even until the time I was a young mother. I always loved looking at them! Roses were always tricky for me so I remember feeling very proud of this one! 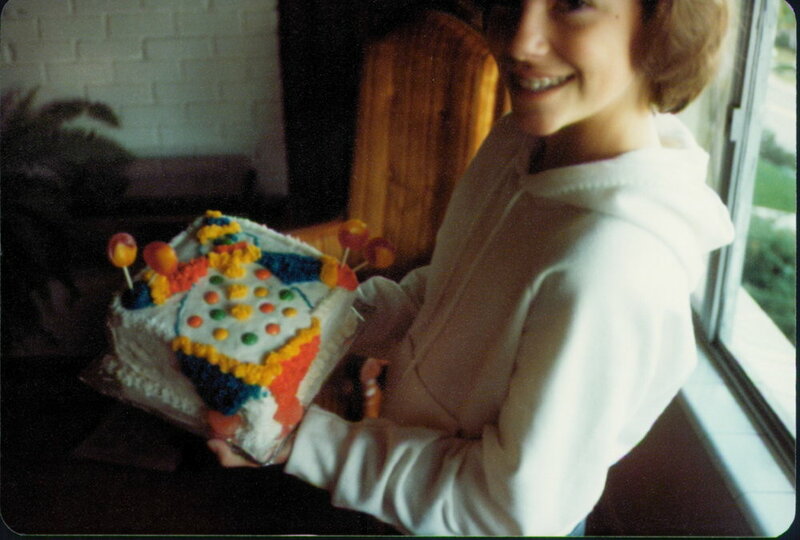 I made a few cakes during my teen years. 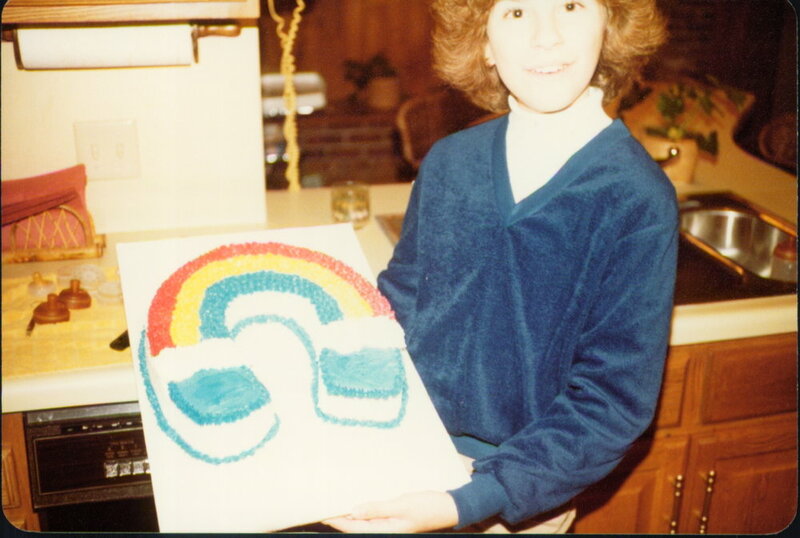 I seem to recall making one for my brother's birthday once, but I have no idea what it was and I've never run into a picture of it. I did let the hobby slide away during college and the early years of marriage, but I was very excited to make and decorate a cake for Alex's 1st birthday. It seemed so important to me at the time! I bought cake decorating supplies and got the idea from one of those Wilson yearbook magazines. It was a darling cake that used animal cookies as decorations and it looked like a merry go-round. I was a little rusty, but it still turned out cute. Everyone in both of our families was traveling on my son's first birthday except for one grandpa (my hubby's dad) so he came over and celebrated with us. We took pictures of the celebration and the cake, of course. And you know what? I've never seen those pictures! They must have gotten lost by the developer. I've always been super bummed when I think about my first born child's first birthday pictures being lost! So sad! I've thought about trying my hand at cake decorating again over the years but I've always felt guilty because I certainly don't need to have a hobby that is based on sugar. I did get into cookie decorating around they year 2002. I hosted a few parties and showers where I used some really big butterfly cookie cutters and decorated them up in true Martha Stewart fashion. They took me hours but they were really pretty. Why on earth didn't I take a picture of them?! Well, someday I might just get out the frosting tips again and play around with some treats. In the meantime, I can browse the Wilton website and Pinterest for some beautiful sugary creations. Are there any hobbies from your past that you think about revisiting? Any that you dream of? Do you have pictures to illustrate these stories? Even if you don't, it's still worth jotting them down for a great Memory Monday exercise.